Giveaway Closed! Winner is #10. I really love today's giveaway. 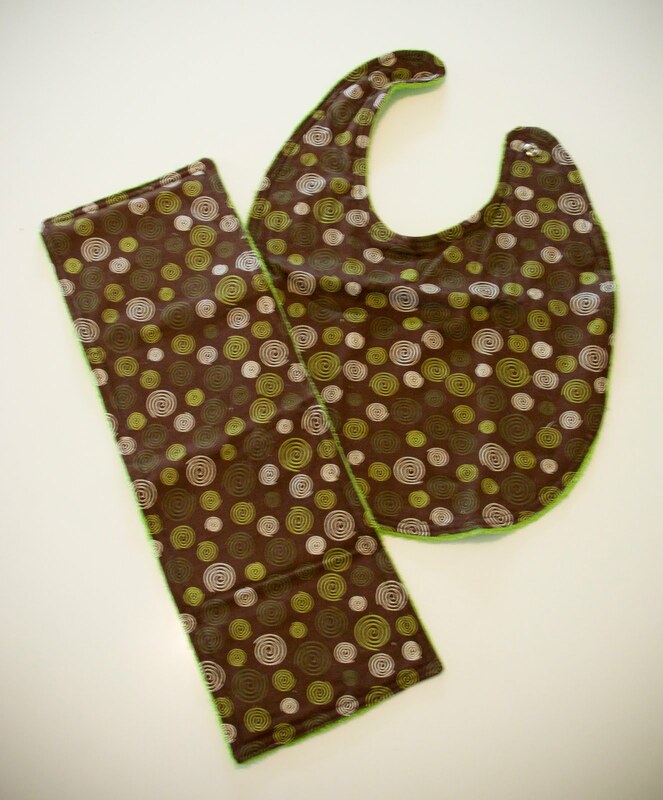 Cassie, of Tortoise and Hare Etsy Shop, is giving away a handmade bib and burp cloth. 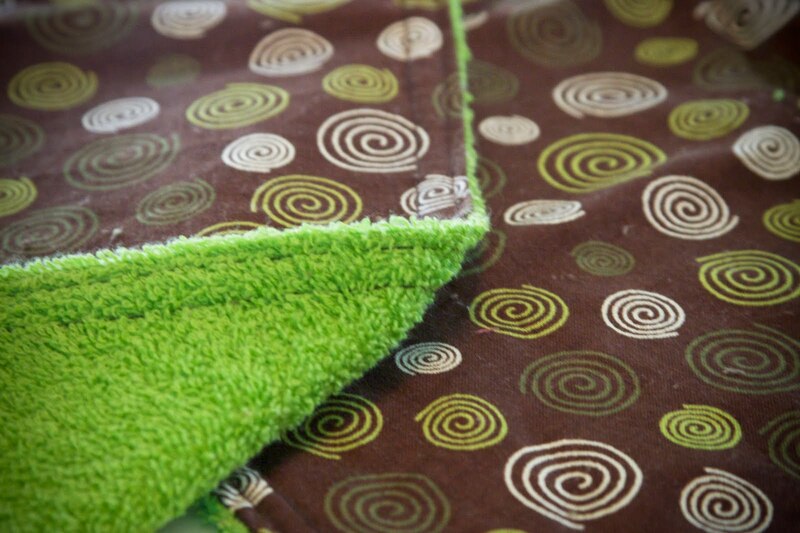 The cute swirl patterns is perfect for any mod baby, in brown, cream, and green. The back of each is lined in bright green terry cloth. The slender, long design of the burp cloth makes is the perfect width for your shoulder, or even draped over your knee as you calm a colicky baby's tummy. And the bib is a generous size to amply cover your little one during meal time. The best part about Tortoise and Hare is the heart that goes into her products and each order. And the proceeds from sales go to benefit Cassie's daughter's medical condition. To read more, visit her PROFILE. This giveaway will end at midnight PST, Thursday June 24, 2010. To enter, visit the Tortoise and Hare Etsy shop and view Cassie's other designs. Then come back and leave us a comment with your favorite design. Please leave your name and e-mail address in the comment section below. Only one entry per person. One winner will be chosen with Random.org and posted the following day. If we don't hear from the winners within 24 hours, they will be forfeit, and a new winner will be chosen. I love the turquoise damask pattern! How fantastic are those?!?!?! Evil Pixie @ evil-pixie@live.com. That bip looks SO soft! I also like the Jungle Friends Soft White Baby Booties she makes too. So cute! I love the Zoey the Purple Grey and White Felt Plush Owl!! How cute!!! 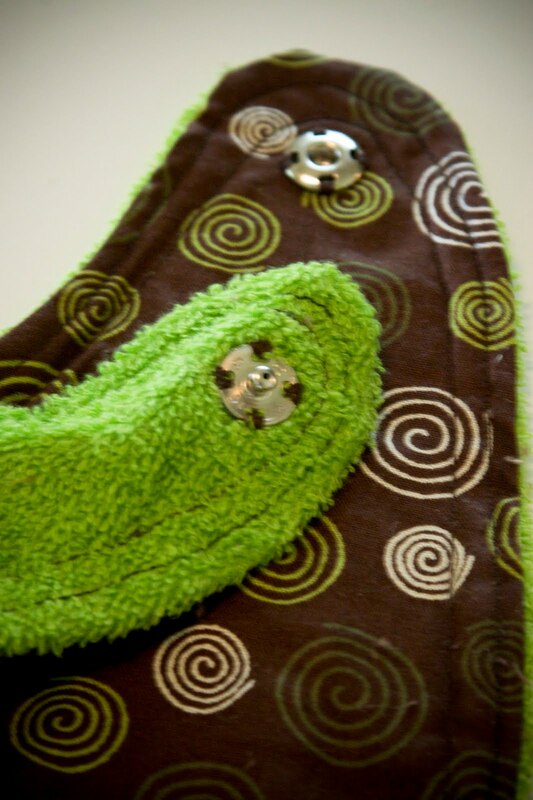 My favorite design is the Olive and Green (The same one shown above!) It works best for my son! I love the dark brown damask washclothes! I want to get them to use for myself!!! What a cute shop!! I love the Mod Earth Tone Circles and Brown Polka Dot Loafers with Wood Buttons, although there are many, many sweet items in this shop. Beautiful work! I really love the White and Pink Mod Leaf design, which is used for baby loafers. Great work!